New technology of UV laser drilling and milling was installed in PragoBoard at the end of March. Highly efficient and accurate system for MICROVIA and blind holes, a dynamic linear motors and precision optics guarantees excellent quality of drilled holes and milled edges. The device can also be used for milling of flexible printed circuits, coverlay masks and other basic materials for their production. There is no need to clamp material into the machine board. Its exact position is secured by the vacuum table and the camera system. 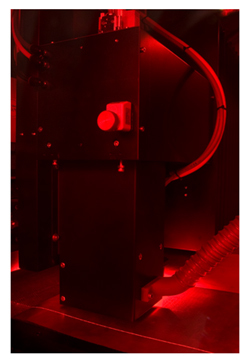 The UV laser cutter will refine on and improve production of FLEX-RIGID boards, where classical routing technology was not sufficient. With this technology final shape milling will be also improved for any flexible parts and basic material will be saved (due to minimal rebounds of motifs among themselves) and thought the total price for the PCB will be better.